Double Sided Tape | Omni Double Sided Body Mounting | Lowest Prices! The Omni 7050 Double Sided Body Mounting Tape is an aggressive PE foam tape for permanent mounting of various automotive exterior applications. These are acrylic-based adhesive tapes that have been specially designed for high performance. The double sided tapes are highly durable and can be used on various surfaces and materials. The strong adhesive gives high holding power therefore enabling its usage in the place of several conventional bonding methods which also helps in material savings. Used on the right substrate, the tape forms strong and highly secure bonds. It works well in various temperatures making it suitable for a wide range of tasks. 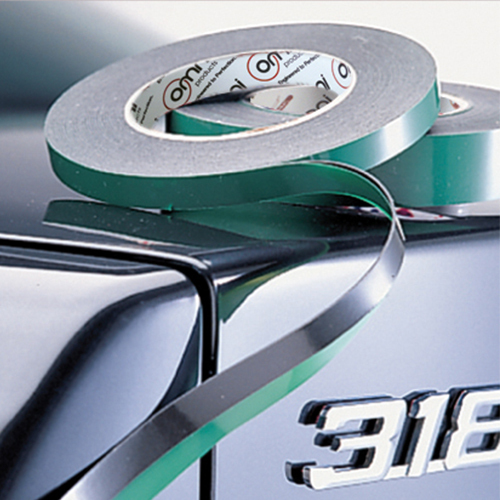 The tape is used for sticking two surfaces together on the body of a vehicle, on walls, cabinets etc. It is also widely used in arts and craft, in exhibitions and museums, and for pasting display material on the wall. Our tape is popularly used in the automotive industry for permanent attachment of mouldings, emblems, trims and fixing mirrors on the bodies of vehicles. These tapes age well and are easy to use. The Omni Double Sided Body Mounting Tape is available in various widths, so that our customers can use them as per their convenience. Buy Double Sided Tape Wholesale – Lowest Prices Guaranteed!